Why is the knuckleball such an important style of pitching in the game of baseball? First off, congratulations to the Vancouver Canadians and Hillsboro Hops for advancing to the Northwest League Championship Series, which begins on Saturday, September 6th. Vancouver, after finishing ahead of Tri-City for the second-half pennant and sweeping Spokane in the North Division Finals, is gunning for its fourth straight Northwest League title. Hillsboro, meanwhile, is in the finals for the first time in only its second season in the league, after the franchise relocated from Yakima, Washington. Very few pitchers throughout the history of baseball have mastered the art of throwing the knuckleball, which is a difficult pitch to learn. It is also a difficult pitch to hit as well, as even the best hitters in the major leagues have trouble with the pitch because they are used to seeing 90-mph fastballs and the knuckler throws their timing off. Bobby Bonilla was one of many major-leaguers who hated facing Candiotti’s knuckleball. Tom Candiotti, a knuckleballer who pitched in the majors from 1983 to 1999, told me on several occasions that All-Stars such as Tony Gwynn, Barry Bonds, and Bobby Bonilla always told him they never liked facing him and that knuckleball because it messed up their swing for a whole week after seeing it! Bonilla, a switch-hitter, didn’t want to bat left-handed against the right-handed Candiotti, because he was afraid it would mess up his left-handed swing. Fred Claire, a former Los Angeles Dodger general manager, also once told me that having a knuckleball pitcher as part of your starting rotation helps to give opposing hitters a different look, to take their timing off. Claire’s Dodgers in the 1990s had only right-handed starting pitchers for several years, and he mentioned having Candiotti on the staff was valuable because his knuckleball broke up the pitching pattern, so that the opposition would be seeing different pitches and different speeds during a three-game series, instead of the same 90-95 mph fastballs all the time. The knuckleball simply messes up hitters’ timing. The Toronto Blue Jays thought so highly of that knuckleball too that they specifically had Candiotti start Game One of the 1991 ALCS so that he could try to mess up the Minnesota Twins hitters’ timing. So, manager Cito Gaston went with a rotation of Candiotti-Juan Guzman-Jimmy Key-Todd Stottlemyre in that series, with a soft-tossing knuckleballer going first followed by a hard thrower (Guzman), then a soft-tossing finesse pitcher (Key) and another hard thrower (Stottlemyre). Pat Gillick, the Hall of Fame general manager who acquired Candiotti in Toronto, told me that he liked the change of pace that Candiotti brought to the Blue Jays pitching staff, because he could be put in the rotation in between a guy like Guzman and David Wells, another hard thrower. Yes, there were other knuckleballers in the major leagues such as the Niekro brothers, Charlie Hough, Tim Wakefield, and R.A. Dickey since the 1960s. But Tom Candiotti was almost just as effective with the knuckleball. 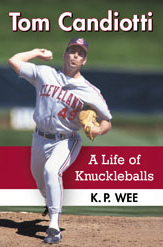 To read more about Candiotti’s career, check out Tom Candiotti: A Life of Knuckleballs, which can be found on Amazon.